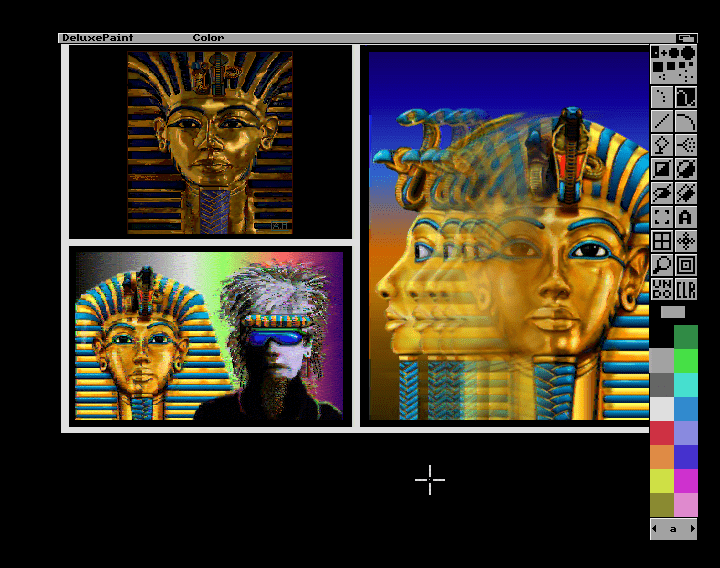 Perhaps one of the best known pieces of software on the Amiga, Deluxe Paint (often shortened to DPaint) was one of the early software titles, with the first version being released the same year as the Amiga 1000, in 1985. Deluxe Paint was created by Dan Silva for Electronic Arts, and was what many call a “pixel editor”, as it dealt with the individual pixels and allowed the user to use set the screen mode used and the colours, and “paint” on the screen using the available tools to change the colour of the individual pixels which make up the screen. 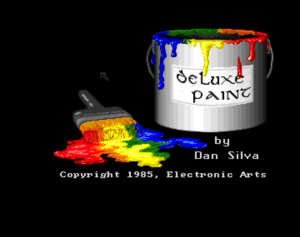 There is an article about the original Deluxe Paint on the Computer History Museum, including the source code, click here to open that page in a new tab. Deluxe Paint II was released in 1986, followed by Deluxe Paint III in 1988, Deluxe Paint IV in 1991, Deluxe Paint 4.5 AGA in 1993, and the final version, Deluxe Paint V in 1995. Over time it gained many features, such as painting in HAM mode, animation features, and the ability to use the new AGA graphic modes. It was often bundled with the purchase of an Amiga Computer, in particular Deluxe Paint III coming with many Amiga 500s, and Deluxe Paint 4.5 AGA coming with many Amiga 1200s. 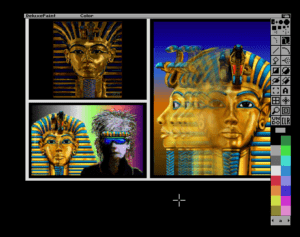 It was also extensively used in the late 1980s and early to mid 1990s for the creation of graphics for video games, not only for the Amiga computer, but for many other machines. For example, it was used to create the graphics for the popular “The Secret of Monkey Island” and “Monkey Island 2: LeChuck’s Revenge” games by Lucasfilms Games. While many may not consider it the best program to use, preferring instead Colantos “Personal Paint” or Digital Creations “Brilliance”, the impact Deluxe Paint had, not only upon the Amiga, but upon the entire computer industry, cannot be denied.